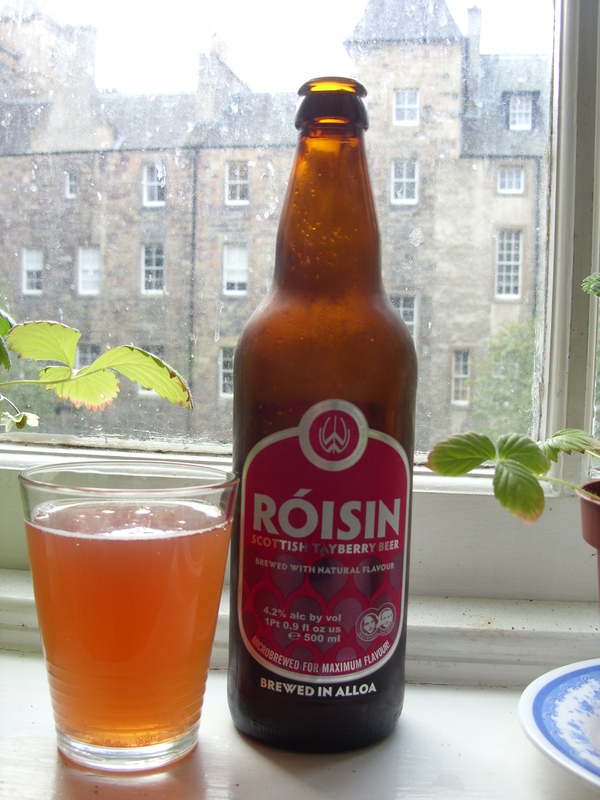 Róisin by Williams Bros. Brewing Co. Since I’m only in Scotland for a year, I’ve made it a point to try as many different foods and drinks as I can before I leave. Most of this stuff is going to be completely unavailable stateside, and although I fear developing an impossible addiction, I can’t help but follow my whims and buy all these tempting concoctions. Williams Brothers Brewing Company is one of those potential addictions which I’ll be unable to satiate next year. I’ve tried at least four or five of their beers so far and every single one has been outstanding. This was the latest, and my favorite so far. Made with the tayberry, which is a cross between a raspberry and a blackberry, it tastes like a hoppy version of grapefruit soda, very fizzy and slightly sweet with that bitter tinge of rind. And isn’t the color gorgeous? I’m a sucker for pink drinks. Being an American, and despite the frigid temperature, I chilled this baby before drinking, and luckily, that’s what Williams Bros. recommends. Crisp, light, fruity, and only 4.2% ABV, this will be a perfect summer beer — if Scotland ever has a summer! Posted in Booze - Beer	| Tagged beer, Róisin, tayberry, William Bros. Brewing Co.
And, now, I want one. Thanks for that! Seriously, nice review. Enjoy your time in Scotland and “Lang may your lum reek”.